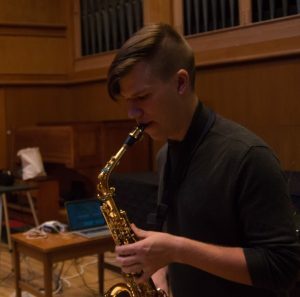 Jake Thiede is a composer, saxophonist and current PhD student at the University of North Texas. Recently, his music has been championed by the Red Clay Saxophone Quartet, the 15.19 Ensemble, STACKS Duo, and pianist Kris Carlisle. He received his BME at Murray State University and MM in music composition at the University of North Carolina at Greensboro. He has studied with Mike D’Ambrosio, Brian Ciach, and John Fannin at Murray State and with Mark Engebretson, Alejandro Rutty, and Steven Bryant at UNCG. As a saxophonist, he has studied with Scott Erickson and Steven Stusek. Current interests are grooves and rhythms in metal music, glitch, and the manipulation of sine tones.